This is a card I made a long time ago. In light of all the things that happened yesterday, I just didn't have the time or energy to make a card. But since I already signed up for Hip Hop Hangover so here it is. So, I made this with Unity's Jolly LIttle Winter. I used a Cuttlebug folder on this that I actually got from WishRAK. It's just a simple easy little card. That's all for now. Have a great weekend and come back on Saturday for EtsyInspired. It's a really fun one and I think you all will love the prize! PS Unity is having a special 20% off sale until Friday with coupon code: HAPPY. (All caps.) Enjoy! Very cute card! I love that penguin. So cute! It's so cute!! I don't know how but I keep passing up those penguins...just too much Unity goodness in the store..LOL..feel better!! What a super cute wintery card! I am so sorry you have been feeling bad, Ashley. This is a super cute card! Hope you feel well soon, sweetie! I'm so sorry to hear about yeseterday! I sure hope the pain goes away soon! Hey Ash!!! Cute card!! Hope you're feeling better today. This is so cute, I am loving this penguin. 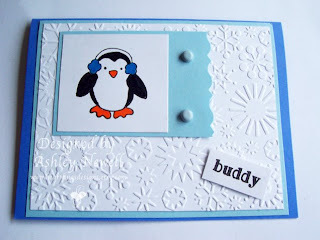 These penguins make for the cutest cards! Hope you are feeling a little better today! I love this penguin, he is so cute!!! Cute card and layout. Oh yes soooo precious!!! This is sooo one of my favorite sets!!! I love the snowflake bg!! This is cute!! Hope you feel better soon!! Those colors and that Penquin are just way to cute girl!!! I love your card!!! Such a CUTE penquin! This is an adorbale card. Great job.